In the United States, two varieties of rye grass are commonly planted, perennial (Lolium perenne L.) and annual (L. multiflorum Lam.). Perennial rye grass is considered a cool season grass and is commonly grown in areas with cold winters, where it is a popular lawn, turf and pasture grass. Annual rye grass is grown in the southern United States for animal forage or as a wintertime lawn color filler. Planting rye seed is fairly easy and differs little from planting any lawn seed. The rye seed can be planted alone or as part of a mixture with other grass varieties. Sow rye grass seed in the spring after the danger of heavy frost has passed in the northern states and in September or October in the southern states. Annual rye grass needs to be sown at least eight weeks before a hard frost in the fall to establish growth. The seeds can be sown directly into a tilled seedbed that is barren of other grasses or broadcast over an existing lawn to fill in bare spots and give a colorful seasonal mixture. Mow existing lawn short before seeding it with rye if you will be sowing the seeds among your current grass. Broadcast 5 pound of rye grass seed for every 1,000 square feet. Push the seed broadcaster evenly back and forth to disperse the seeds. Apply a general-purpose lawn fertilizer at the time of seed planting. Follow the directions on the lawn fertilizer for application. Water the grass seeds and fertilizer thoroughly once broadcast. Push soil over the top of the rye seed sown if it has been sown into an open seedbed by lightly raking or rolling the area. A thin soil covering of no more then 1/4 to 1/2 inch is all that is required. Rye seed that is sown into existing lawns requires no soil cover. Water the seeds regularly. Do not allow them to dry out for best growth results. Within one week, germination will occur. 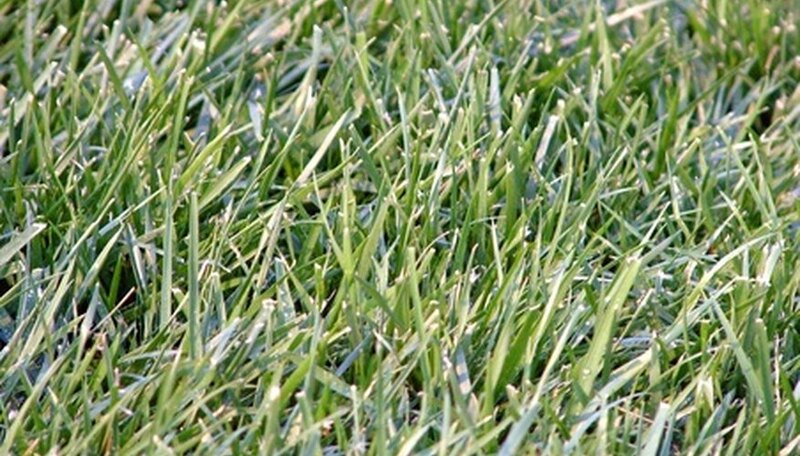 Two weeks after seeding, fertilize the rye grass again using an all-purpose lawn fertilizer. Follow the directions on the label for application, and water the area thoroughly when the fertilizer is applied. Mow the rye grass seed six to eight weeks after planting. Mow the grass to approximately 2 inches in height. Fertilize annual rye grass in the south heavily with nitrogen between February and May. Use 1/2 pound of nitrogen per 1,000 square feet every month. Water thoroughly after each application.